GOVERNMENT MINISTERS WHO repeatedly refuse to answer questions in the Dáil could find themselves on a naughty list. The Dáil Reform Committee has debated the final draft reform report, which aims to overhaul how the Dáil does its business. One of its proposed measures is that the Ceann Comhairle would publish – on a quarterly basis - a list of ministers who, in his opinion, repeatedly do not answer questions fully. Ministers are routinely asked questions on a range of issues - for example, on hospital waiting lists, garda resources, or foreign aircraft landings – to name but a few. Oftentimes, TDs can be disatisfied with the answer, and call on the minister to answer the question asked. 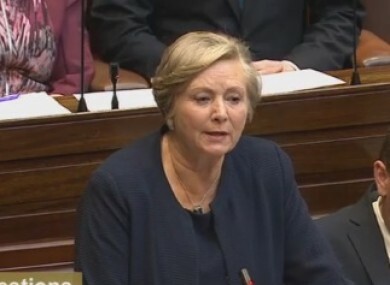 This happened this week, when Sinn Fein’s Gerry Adams accused Tánaiste and Minister for Justice Frances Fitzgerald of not answering his question in relation to the Garda Commissioner, Noírín O’Sullivan. TDs often ask the Ceann Comhairle to order a minister to answer the question, however, currently, there is no power for them to do so. A new measure in the report proposes to give the Ceann Comhairle the power to “rule on relevance… on the spot” where he or she feels there has been a “clear failure” to give the information sought. “I don’t envisage we’ll have to use it,” Ceann Comhairle Seán Ó Fearghaíl said in jest at a press briefing on Wednesday. He said there is already a provision for this in written questions, where a TD can raise it and the Ceann Comhairle can go back to the minister. It’s proposed this will be extended to oral questions and topical questions. Ó Fearghaíl said under the rule change, he will be able to say: “Sorry minister, you are not addressing the question… “. Other reforms proposed include the establishment of a new Business Committee which will decide the houses’ business throughout the year. A budget oversight committee is to be established, which will be supported by an independent parliamentary budget office, which will help “crunch the numbers”. More lawyers are to be hired to the office of the parliamentary legal advisor to help draft legislation and assist backbench TDs. More than one technical group will be allowed. Smaller parties can merge together to make up a group, and a technical group can be made up of five, instead of seven, members. There is going to be a new Irish language committee set up also. Ó Fearghaíl said the reforms to hours will make the Dáil more “family friendly”, with many votes to take place on Thursday afternoons. “If you step back and look at this report in its entirety, it is probably the most dramatic sweep of reforms this Dáil has seen in decades,” said Fine Gael’s Eoghan Murphy. Email “Ministers who avoid answering questions could find themselves on a naughty list ”. Feedback on “Ministers who avoid answering questions could find themselves on a naughty list ”.